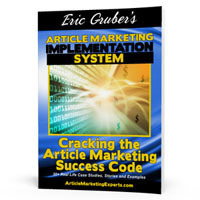 Today, Article Marketing Expert Eric Gruber is launching his newest product: Cracking the Article Marketing Success Code at http://www.crackingthearticlemarketingcode.com. 1. How he went from being an unknown to becoming an article marketing expert whose articles are published on top websites like About.com, Site Pro News and Marketing Profs. 2. How he made more than $10,000 in just 2 months with 1 article. 3. How Dr. Mark Hyman promoted his book to the top of the New York Times Best Sellers List with articles. 5. How fitness expert Tracey Mallett tripled her online exposure, traffic and sales. 6. Plus, many more (30+ in total) step-by-step article marketing case studies and success stories. Eric’s new ebook fills in the hole that every other article marketing ebook, article marketing course and article marketing system leaves untouched. To learn more about Eric’s newest article marketing product: ”Cracking the Article Marketing Code,” go to: CrackingtheArticleMarketingCode.com. You can also call Eric at 908-380-8564 or email: eric (at) articlemarketingexperts.com.